Immerse yourself in the Green Retreats experience Take a tour of their 11 fully furnished garden rooms at their Buckinghamshire showroom. If you want to start planning your garden room project for 2019, you might like to visit Green Retreats indoor showroom over the holidays. Green Retreats have the largest garden room show site in the UK. It is a good idea to explore a garden room before buying. My Eco Space makes this easy for you, just book a free appointment for a Skype or FaceTime tour & consultation. Garden Hideouts are purveyors of high-quality garden rooms, pods and shepherds huts. Visit one of their show sites to see the quality up-close. Building With Boxes are looking for a new home for their show building. Built to a high specification with SIP’s core construction and aluminium doors and windows this would be a good buy for someone with the right garden. It’s a couple of months away but we are delighted to hear that Pod Space will be exhibiting their Micro Pod Max at Grand Designs Live at the NEC in Birmingham between the 7th and 9th October 2011. 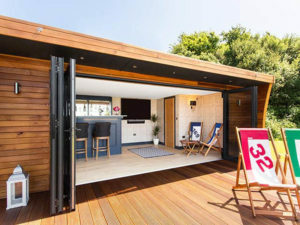 We recently profiled the Micro Pod Max on The Garden Room Guide and Grand Designs Live will offer interested parties the chance to experience the quality of this garden room up close. You will find Pod Space at G544 (opposite the VIP area) in the Grand Show Gardens section. If you want discounted tickets for the show visit the Pod Space website for details. Next week we will be showcasing another of Pod Spaces new ranges, the Eco Pod. A few weeks ago The Garden Room Guide was awash with details of the garden room companies going to Grand Designs Live. One firm, Garden Spaces had designed the feature building for the Grand Gardens section of the show which was to be used as a garden design centre. Our last article showed the visualisations which Garden Spaces had produced for their new Apex Duo range and we thought you would be interested to see the real thing! The garden room was such a success that Garden Spaces have been asked to design something new for next years show! FOUNDATIONS: Pressure-treated timber bearers on dry mix concrete pile foundations in “normal” garden conditions. MAIN STRUCTURE: Floor, wall and ceiling are made from structurally insulated panels system (SIPS) – filled with highly thermally efficient expanded polyurethane. SIP’s thermal efficiency value, U = 0.27 w/m2 k (equivalent to 320mm of Rockwool). DOORS, WINDOWS and SCREENS: 1 off – 1.8m wide x 2.05m high French Doors and a variety of symmetrical side screens all 2.05m tall; all in aluminium (choice of 3 standard colours) with high security locking to doors, key operated locks to doors and high performance double glazing (Celsius Clear – Argon gas filled, heat reflective, thermal insulating, UV protective & easy clean) with toughened glass. ROOF CONSTRUCTION: SIPS dual pitched roof, covered in breathable waterproof membrane. Mertoshingle finish with matching ridge (30 year guarantee) and wooden soffit & barge boards (coated in Tikkurila ultra paint – RAL colour coded to exactly match the aluminium frames. Hidden black plastic rainwater guttering to both sides. EXTERNAL CLADDING: Western Red Cedar (zero maintenance) T&G external timber cladding. Walls: Fully plastered finish & decorated interior (matt white) with 4” painted skirting boards. Floor: Solid wooden flooring in a variety of finishes, or with round stud rubber tile flooring (various colours). FIXTURES & FITTINGS: 1 double dimmer light switch (brushed metal), 6-10 double power sockets (brushed metal), 8-16 internal recessed downlights (brushed metal), 2 external lights with top and bottom outputs (brushed stainless or anthracite) and consumer unit with RCD. In addition Garden Spaces have a range of upgrade options, prices for the Apex Duo start at £19,500 for more information visit the Garden Spaces website. Executive Garden Rooms recently launched their new show building at the Sherborne Castle Country Fair, although all Executive Garden Rooms are bespoke and therefore unique this new show building gives customers the opportunity to see the style of Executive Garden Rooms, the materials on offer and the quality of the workmanship. The show building garden room is 4m wide by 2.7m deep giving an overall external footprint of 10.8sqm; the garden room has a contemporary feel with flat roof and floor to ceiling glazing on the front elevation. The garden room is clad in cedar and we particularly like the subtle colour difference in each plank which makes a striking contrast to the dark French doors and windows. So, what inspires Executive Garden Rooms? Executive Garden Rooms are a family run company, who only take on one project at a time so that they can provide the best service to the customer; this includes full project management so the customer has a stress free installation. Executive Garden Rooms like to work closely with the customer and incorporate their ideas into the design meaning the customer will end up with a unique quality room to suit their requirements that is different from any other. The garden room shown in the pictures above is sitting on a raised base for easy transportation but garden rooms will normally sit on a concrete slab so there is no need for raised decking.